Personalized Gifts for Sanjiv Uncle! - From Bhanu! Bhanu is an angel blessed to one of my best friends, Devki. 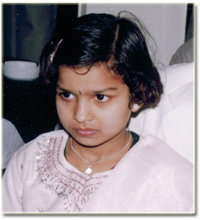 I know Bhanu since year 2000, the time when she was a very small kid. Devki and I were colleagues in office and were (and still are) very close friends. I often use to visit his home to meet his family. "So Uncle, what did you do today?!" And I would tell her about my day's schedule occasionally responding to her 'Why(s) and what(s)' during our ever-interesting discussions (Q&A sessions!). So after listening to me, she would start telling me about her day's schedule. Starting from what time she went to school, what and which teacher said what to her, who all got beating in the class for misbehaving, how much marks she got in her tests to all the home work that her teacher gave her for that day... so on and so forth. Smiling at her innocence and nodding at her statements as if I knew all the people she was talking about I use to listen to each and every bit of her never ending piece of 'information' that she had to share only with her 'Sanjiv Uncle'. Time flew and our days, weeks, months and years went by... and today, my Bhanu, that same little angel, is a grown-up child who feels shy when I tell her about all those wonderful days. 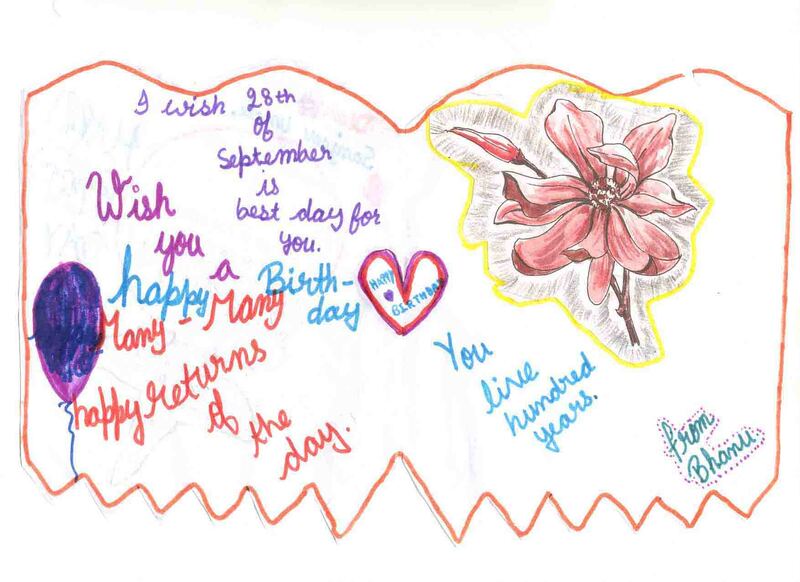 In all these years, one thing that my Bhanu never forgot was her Sanjiv Uncle's birthday. 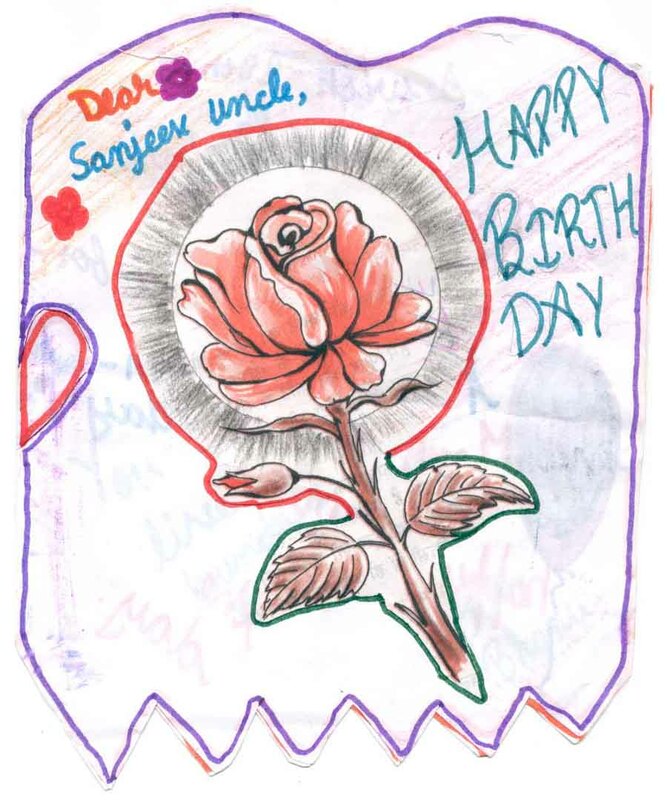 Each year, on my birthday, she sends me gifts beautifully crafted and hand-made by her own little hands with utmost care and love for her 'Sanjiv Uncle' (that's 'Proudly' me!). For her, 'Sanjiv Uncle' is her best friend in this world and so is 'Bhanu' for me. Want to see what my best friend sends me? 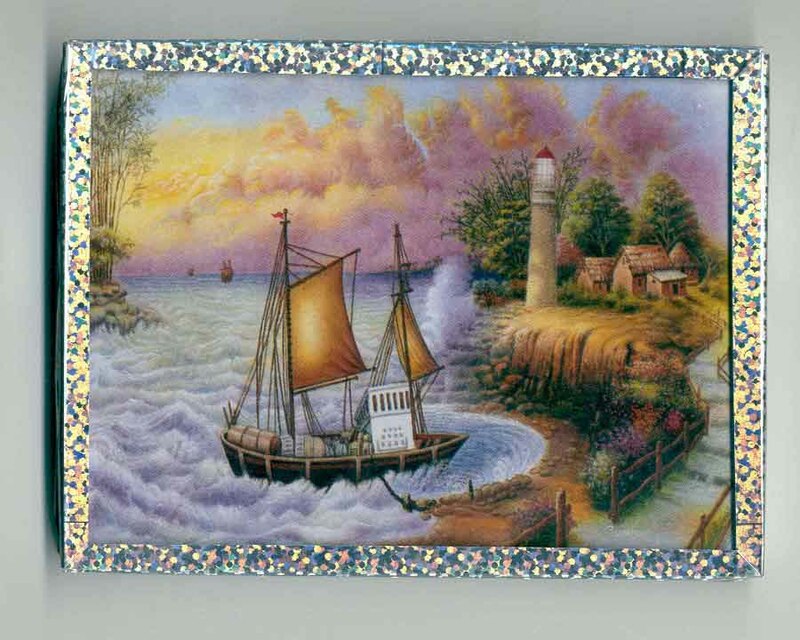 This card with flower as you see on the side is the beautifully hand painted personalized card from my Bhanu for me. This is not something that she bought from malls, she made all this by herself using the sketch pens, pencils and papers torn out of her notebook!
" Fly to Sanjiv Uncle "
I don't know if I'll live that long or not (I do not wish to though) but look at her wishes - do they not make you feel that one should have a heart as pure as that of my Bhanu...?! 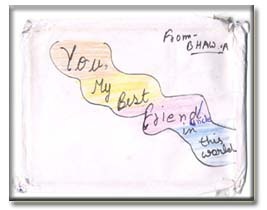 This is the front side of this personalized birthday card. 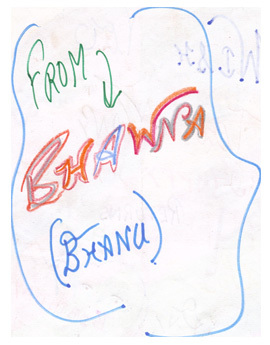 Open the card above and inside is this message from my Bhanu. 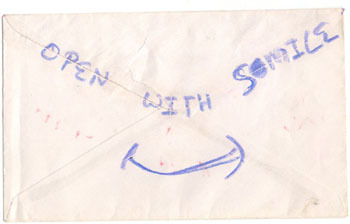 And of course by now you know who sent it to me! 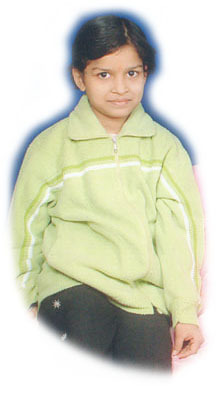 - My Bhanu! 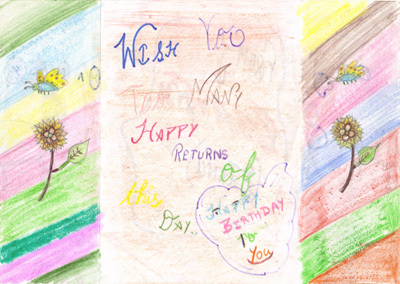 Its not that I have not received cards before, but these are really special cards for me. They are not any ordinary cards. They have my Bhanu in them - hiding in every bit and piece of this page torn out of her copy - a page that has more worth than any other paper in this world... They have all her feelings, all her emotions and all her love in each word. They really are not just a card - they are something beyond that... something really more. A painting that she framed herself and sent to me as a surprise gift on my birthday! 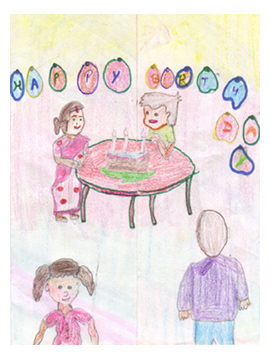 What an amazing child my Bhanu is, and of course, perfectly amazing is her 'Sanjiv Uncle'! - Isn't it?! Well, what I shared with you here are just some of my gifts that I received from my Bhanu. I also shared with you the emotional bond that I have and share with her. I hope you got the message that I was trying to convey through this exchange of emotions. If yes, then pick up the phone and call the first person who comes to your mind after reading this page. So make that call and make a difference - Now! And If you have something to share, please Click here to share your experience with us! We'll be honored to put your story on this site. Please subscribe to our monthly newsletter, 'Emotionally Yours' and see how people make a difference in the lives of the ones they love and how YOU can make a difference by way of gifting.